If there is one thing more enjoyable than a round of golf with friends, it is perhaps a round of Crazy Golf with the family. 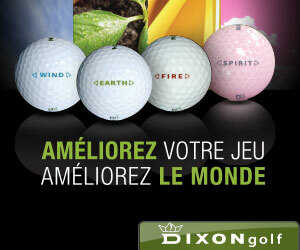 My Golf 3D (free version) brings to life this fun activity in an app for Android and Apple devices. In this review, we’ll examine some of the positive as well as negative aspects of the game, allied to whether it represents a must-have download, or whether it is one to avoid. 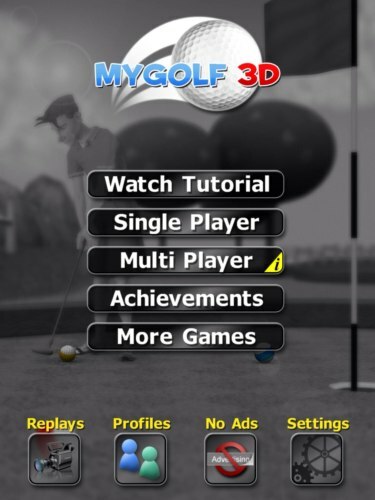 The first thing to note about My Golf 3D is that the initial game is free, though if you want to get rid of the advertising and add a host of other features including the opportunity to play against other human players, then you can unlock the full version of the game for a price of £1.49 by following an in-game purchase screen. But is the game worth £1.49 of your hard earned cash? Let’s find out by investigating the key features of the game. 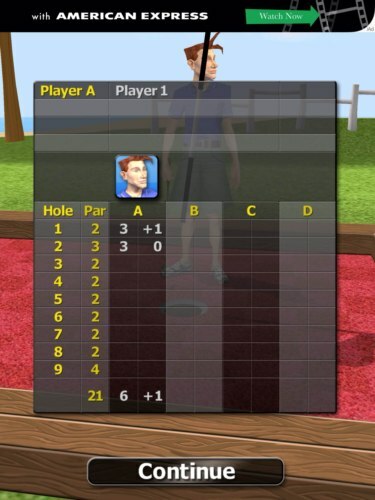 Once you begin the game you can select from one of four golfer slots available and personalise your golfer by selecting what they look like and which ball they would use, as well as the stance to play and whether you want the additional assistance of the putting guide showing on screen. Lastly, enter your name and your preferences will be saved. Once you’ve selected your golfer, you can then choose which colour flag you want and from a choice of three nine-hole course to play; Look Out Point, Palm Sands and Rock Valley. Each course is updated each time you play keeping track of the number of rounds you have played on it and what the average round is on the course. This is a nice touch as it means you can always try and better your best score (or indeed any of the top scores the game records) each time you play. Once the game loads up the player simply decides where to putt by selecting a direction on the screen. They can move their golfer left and right on the teebox too change the angle of a putt and lastly they can adjust the speed of a putt using the power bar on the right hand side of the screen. 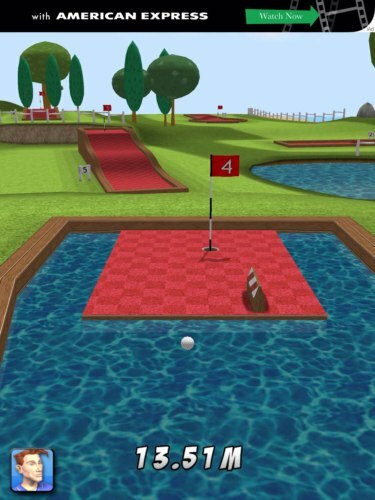 Of course being based on crazy golf, each hole has its own challenges as you can see in the screenshots on this article. Some are markedly more difficult than others and achieving par is a good result on some of the trickier holes. The mechanics of the ball seem to be spot on, although the actual size of the hole does seem rather large in comparison to the ball itself. The graphics in the game are excellent. Bright, colourful and bold. The animations are smooth and there is little to no lag in the graphics, even when there are several moving objects on screen. The game designers have added some nice touches too, with the groaning sound effects of a missed putt (complete with a frustrated reaction from your golfer if you don’t hit par). The in game music is cheery enough, but does tend to grate after a few games, though fortunately you can always turn this off in the settings, or just reduce the volume. My Golf 3D certainly has an addictive element. The fact that the app saves your best scores means that each time you play you have something to aim for in order to improve. 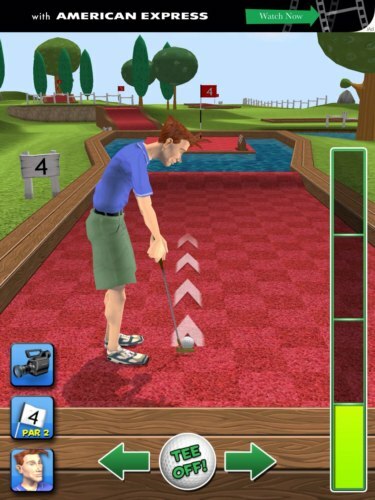 If you have multiple users using the same iPad, they can also take one of the four golfers as their own each time they play and this creates a multiple player leaderboard, which makes the app all the more challenging. The holes are difficult enough so that they are not easy to master. Luck does play a part in many holes, but even so, once you have played a few rounds players will be able to knock strokes off their scores relatively easily by learning how to best play key holes. Overall, this is 27 holes of Crazy Golf that have been presented in a fun and enjoyable way. It isn’t a golf simulation, but it does offer the same kind of enjoyment as you would get playing real crazy golf. There’s plenty to like about My Golf 3D. The graphics are big, bright and bold, the gameplay is simple enough for anyone to play, but difficult enough so that it is not easy to master. The Free version certainly represents great value, but for £1.49, I’d want more than just the adverts removing (which are not too intrusive anyway) and a few extra options for my golfer and for playing against others. The main downside of the app is its lack of courses. 27-holes is great but you can quickly tire of playing the same three courses again. An additional 3 courses for your £1.49, would have made buying the app and altogether much more enticing proposition. That said, My Golf 3D is fun, fast and enjoyable and certainly well worth downloading for a game or two either individually, or against friends and family.